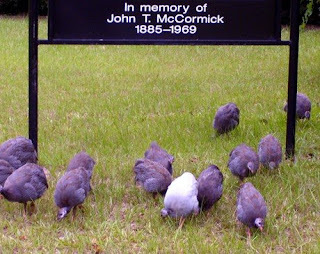 Wild Turkeys at Beech Springs Cemetery: Once again, the work of a fellow Graveyard Rabbit provides inspiration for a post to this blog. Mr. Morgan at the Central Florida Graveyard Rabbit composed Graveyard Wildlife, an article about an active bald eagle nest in a downtown Orlando cemetery. This reminded me of a visit I made this past summer to Beech Springs Methodist Church Cemetery in Twiggs County, Georgia that had several young wild turkeys running through it. They were hanging around the church sign when I pulled up. I thought they would surely run from me, but they didn't. I took a couple photos before I even stepped out of the car. If you are interested in learning more about this Beech Springs Cemetery, seeing more video from the cemetery, and connecting to more burials information, please visit my August 2008 post. Elmwood St Joseph in Iowa has flocks of Canada geese in residence year-round. I think this is intentional, since the cemetery has a good-sized pond.